For the purposes of your Roadmap to health, one way we can look at your DNA that you inherit at birth is a car you are given that needs to last your entire lifetime. This car allows you to travel on your personal journey through life. It is this car and knowledge of its mechanical issues that enable us to chart your personal Roadmap to health. Some people may be more fortunate in the quality of the car they receive; they may receive cars that are designed to last two hundred thousand miles without needing much more than a simple tune up. Others may receive a vehicle that has significant issues. If we know what those mechanical issues are, we can take care of that car so that its problems can be bypassed for a smoother ride through life. What we are given is what we need to contend with. We have very little control over the DNA that we inherit. The car we get is what we are saddled with for our entire lives. In order to get an understanding of the impact of genetics, it is important that you fully realize that the DNA you have inherited will not change. This is the DNA you will have for your entire lifetime. The same DNA you have at birth is the DNA that you have in the later years of your life. Virtually every cell in your body contains identical DNA, which is why blood, saliva, hair, fingernails can be used to evaluate your personal DNA. There are approximately 25,000 genes in the human body that code for proteins, but it is not practical to look at all 25,000 genes. While every cell in the body essentially contains the information about your total genetic profile, tests that look at genetics choose specific genes to evaluate and look for changes or mutations. I personally believe in only looking for changes in the DNA in well-defined nutritional pathways where it is clear how to add natural supplements to bypass imbalances. My personal opinion is that running tests that result in a laundry list of mutations without a way to use nutritional support to bypass these mutations is not ethical. I feel that whether you have a test that gives you 30 or 1000 or 5000 markers this is still only a fraction of the total number of genes in your body and frankly having more markers is not the issue. The real question is whether the information that you have is in a pathway that has been characterized so you know what to do to help restore your body to health. Again, to reiterate, changes in the DNA that can impair its function are called SNPs. This stands for single nucleotide polymorphisms. SNPs are single changes that can occur in any portion of the DNA that modify the ability of the DNA to function. You can think of a SNP as a slight imperfection in your car that can affect its performance. If your car that you have been given, the car that needs to last your entire lifetime has a weak clamp holding your tailpipe in place that could be considered a SNP. You may have a weak clamp in your car, as compared to another individual who received a car without a weak clamp. That other individual does not have a SNP in a location where you unfortunately do. A weak tailpipe clamp might be considered a less severe SNP or mutation. On the other hand a defect that causes your engine to spontaneously catch on fire would be a significant SNP or mutation. There are times where what may seem insignificant, actually has the potential to become a more serious matter. Recently over a million high end vehicles were recalled for a missing battery cable cover. While at first glance this seems minor, the lack of the battery cover potentially caused cars to catch on fire. Bottom line, we are not just concerned about the number of SNP or mutations that your car has, but also the type of SNP and the effect that mutation has on the safety and ability to drive that car. This again highlights why I feel so strongly about only looking for SNPs where you understand their impact, where you know what pathway they are located, and where you know how to bypass and remedy the situation. Finally, and I will talk about this more later, it is not just the car you are given for life, but also the way you drive it that affects its survival. You may be given the most high end vehicle, with no defects or mutations at all, but if you drive it at excessive speeds and never service the vehicle and are reckless the result will be a serious or fatal accident despite the quality of the car. The nutritional pathway that this program focuses on, is something I call “The Methylation Cycle”. The methylation cycle is a well-defined nutritional pathway in the body such that it is very clear where support can be used to bypass mutations. Since it is a key concept, I reiterate that the field of nutrigenomics is the study of how natural products and supplements can interact with particular genes to decrease the risk of disease. By looking at changes in the DNA in these nutritional pathways it enables us to make supplement choices based on your particular genetics, rather than using the same support for every individual regardless of their unique needs. Knowledge of imbalances in nutritional genetic pathways allows you to utilize combinations of nutrients, foods and natural nucleotides to bypass mutations and restore proper pathway function. However, before we get to supplement suggestions to help you on your road to health and wellness, it is important to understand that most mutations or SNP variations that are revealed are NOT “all or none mutations”. In other words, if you or your loved one has a mutation or SNP variation, it does not mean that the activity of the gene is completely “off”. It may simply mean it functions at a lower efficiency. When you look at the suggested nutritional support, you are working to increase the ability of the entire Methylation Cycle to run properly, keeping in mind that it has been functioning to some degree in spite of any mutations in particular genes. Just as the physical location of your hometown will not change, your genetics will not change over time either. For this reason nutrigenomic test results will serve as a Roadmap for your future. Knowledge of your genetics is like having an ultrasound that allows you to see inside your own individual DNA. This is important information that can be used to help avoid potential health issues. Suggestions that are made may be valid today, as well as next week, next year or ten years from now. Once you slowly implement a supplementation regimen that is designed to bybass the mutations, this helps in supporting the Methylation Cycle to function properly. 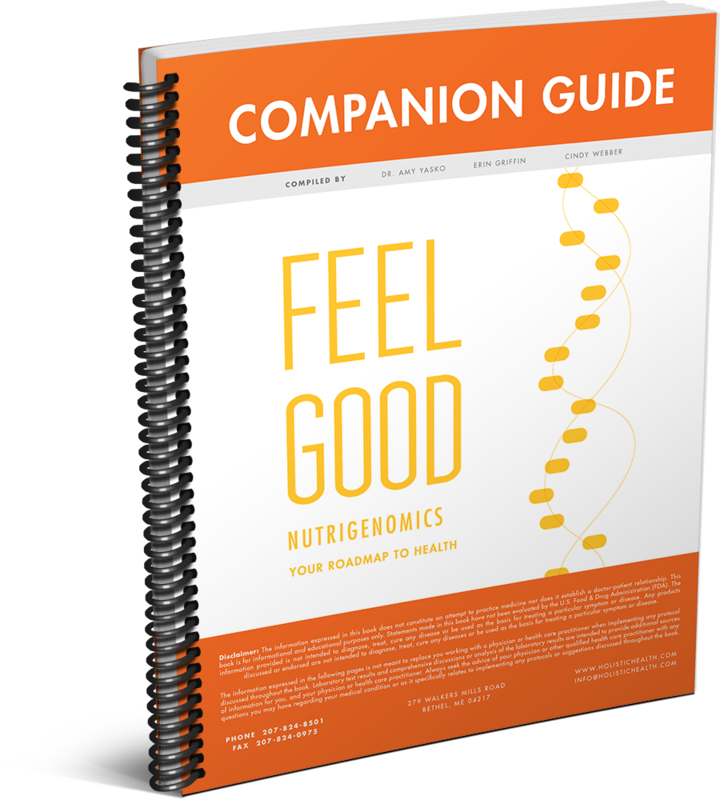 Nutrigenomic test results that look at SNPs in your DNA should help to put your mind at ease by giving you suggestions that you can act on. Nutrigenomics is a form of genetic testing that supplies information that can translate into positive constructive action. I see the ultimate goal of nutrigenomic testing to serve as a guide toward proper supplementation to bypass genetic weaknesses identified by SNP results. Another way to look at SNPs in less technical terms is to go back to the concept of thinking of SNPs as defects in your car. At any time these defects can create havoc such that your car gets stuck on the road, blows out a tire or creates an accident on a highway. If you start to think about the biochemical pathways in your body as roads and traffic circles you can see how your car being stuck in the middle of a lane prevents the flow of traffic on that particular roadway. I see and define The Methylation Cycle is a series of four connected traffic circles. Your body needs to navigate these four traffic circles in order to process nutrients properly. As an example, if these traffic circles are not functioning as intended non ideal compounds can build up in your system such as high homocysteine. High levels of homocysteine have been linked to atherosclerosis (hardening of the arteries), heart attaches, stroke, blood clots and possibly Alzheimer’s disease. The goal is to compensate for the defects in your car, in other words to bypass the SNPs in your body, so that the four traffic circles that are part of the Methylation Cycle flow properly such that there are no blocks on these roadways. This helps to support the body so that nonideal compounds do not build up; additionally that the desired products of these pathways are produced. With the knowledge of where your nutrigenomic weaknesses are, we can predict the places accidents are likely to be located in your traffic circles. It is then possible to use appropriate nutritional support to bypass the accidents, to take alternate routes around the trouble spots so that the products of these four traffic circles are what you desire and nonideal compounds are avoided. By using nutrigenomic testing that focuses precisely on the Methylation Cycle, it is possible to determine the SNPs in this particular pathway. While this does not give us the information about the remainder of the 25,000 genes, what it does is to let us know what is going on with a well characterized set of traffic circles where we know the end products that are desired and where we know how to use supplements to bypass issues. We know the actual locations we are interested in. We know the exact intersection/cross streets where we want to know if there is a traffic issue or not. So ahead of time we have ‘eyes on the ground’ placed at those precise intersections looking to see if there is an issue or not along those highways, necessitating that you take a detour to get around the traffic accident. SNP information allows you to discern between a minor fender bender, a serious fatal accident or a car stopped by the side of the road to ask for directions or one whose radiator has overheated. There are several reasons why this program focuses on the Methylation Cycle. First, as you will read about in the next section the Methylation Cycle has a critical editing function in the body that has the capacity to get around other SNPs in different regions of your DNA. As I will discuss in a few moments, the Methylation Cycle helps to serve as the built in mechanic for the car you have been given in this life. Even if your car has more defects that someone else’s, with proper functioning of the Methylation Cycle you can compensate for the state of the car you were given. Second, the Methylation Cycle is a combination of four well defined nutritional pathways. As I already stated, I do not believe in genetic testing if you have no positive course of action to deploy once you obtain the results. Aside from the critical role that the Methylation Cycle plays as your body’s personal mechanic, the compounds in these cycles are well known, understood and nutritional support to bypass imbalances in these cycles are well known. So you have a concrete path to follow to get around issues in the Methylation Cycle. Finally, I feel that it makes logical sense to comprehensively look at one region. If you wanted to travel from your hometown to my rural town in Maine you would need a map with detailed directions. This would be especially important if certain roads along the way were closed due to construction, bridges out because of flooding, or road detours. It would help to have a detailed map drawn for you that took all of these specific situations into account. Your nutrigenomic test tells you where the “construction” sites are located, which bridges are out and where detours are on your individualized map. With this knowledge you can put together an analysis that will help you to get from your hometown to my hometown in Maine without getting stuck in a ditch or lost on a detour. The more information you have about specific genes in this particular pathway the easier it is to construct your personal map. This is analogous to having the model of your car, knowing how many miles per gallon you get, how often you feel you need to stop at a rest area and when you need to fill your tank or take a break from driving. With this information you are in a better position to plan your trip. This is different from other tests that may tell you where your hometown is located and your destination lies on a map, but without any of the specific information between those two points. Without the details, you do not know if the route you may choose has been closed, if the bridge is out, of if there is a detour that will add more time to your travel. Given only a starting and stopping point, on the map means the rest of the trip may simply be guesswork. Focusing on the Methylation Cycle allows you to look comprehensively at a very critical pathway in the body and from that construct a personal Roadmap to Health and wellness. Nutrigenomics is just one aspect of the factors that determine your health. As I talked about earlier, it is not just the car you are given (the genetics you are born with) it is also how you drive that car that plays a role in your health. How you care for that car, how often you service it, how fast you drive it all impact how long that car will last and how well it will function. I see complex health conditions as multifactorial in nature. That means that while your nutrigenomics are a piece of the puzzle they are not the whole picture. The environmental burden of toxins you are exposed to, along with infectious agents (viruses, bacteria, fungal infections, yeast) and the stress on your system all impact your overall health. I believe that most health conditions in society today are multifactorial conditions, meaning that a number of circumstances need to go awry simultaneously for nonideal health to manifest. Multifactorial conditions stem from underlying genetic susceptibility combined with assaults from environmental stressors and infectious agents. Basic parameters like age and gender, along with other genetic and environmental factors play a role in the onset of non-ideal health. Infections combined with excessive environmental burdens will generally only lead to serious problems with health if they occur in individuals with the appropriate genetic susceptibility. Personalized nutrigenomic screening is one clear, definitive way to evaluate the genetic contribution of multifactorial conditions. Part of what makes the Methylation Cycle so unique and so critical for our health is that mutations in this pathway have the capability to impair all of these factors. This would suggest that if an individual has enough mutations or weaknesses in this pathway, it may be sufficient to cause multifactorial health issues. Methylation Cycle mutations can lead to chronic infectious diseases, increased environmental toxin burdens and have secondary effects on the expression of other genes.